Here at Inland's Best Home Improvements & Handyman Service, we handle it all! ATTN:Listing agents and property managers, we are at your service. We believe in CURB appeal. 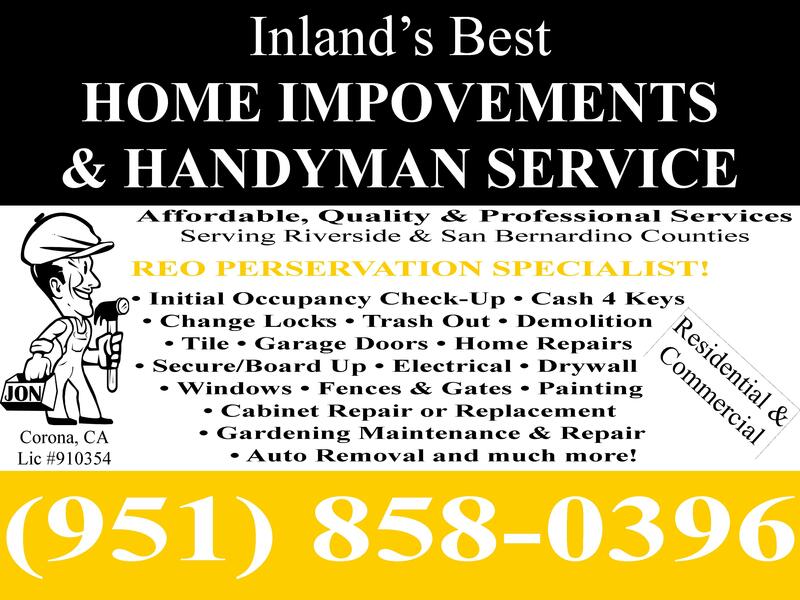 Inland’s Best Home Improvements is your comprehensive REO rescue team. We will help you remove those unwanted properties from your balance sheet as quickly as possible. The goal of your institution is to minimize negative financial impact to your organization. To do so you need to sell property quickly. This requires completing repairs and cleaning on some properties. We handle it all, everything from A to Z! Inland’s Best Home Improvements can complete this task for you and it will speed up your sales cycle and increase the sale price. We assist by providing complete management of all properties from lock-out through final walk through of meeting all required needs by you our client. We get the job done efficiently. You can contact us by phone or email to schedule your appointment. Please feel free to contact us anytime. We are available 24 hours a day, 7 days a week for emergencies. Copyright 2011 Inland's Best Home Improvements & Handyman Service. All rights reserved.